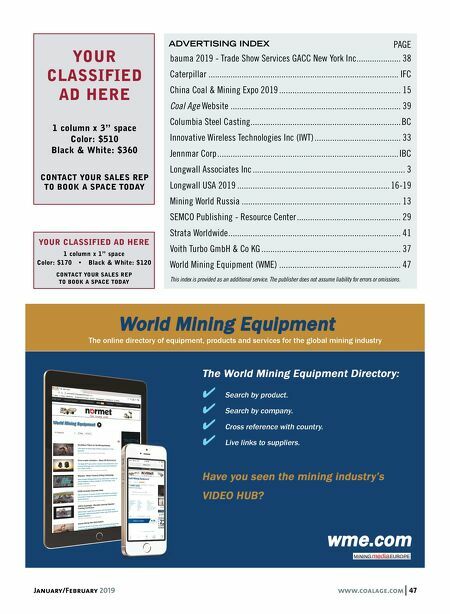 46 www.coalage.com January/February 2019 CONSULTANTS, SERVICES AND WANTED SILO, BIN & BUNKER CLEANING SERVICES & EQUIPMENT www.molemaster.com/industries-coal.asp 1.800.322.6653 • Exclusive Big•Mole™ service cleans out silos and bins quickly and efficiently • Junior™ 360º Whip Machine and Arch•Master™Auger Drill for smaller jobs • Clear away tough blockages with Safe-T-Shot™ CO 2 Blasting • Clean interiors and exteriors with media blasting CONTACT US TODAY! 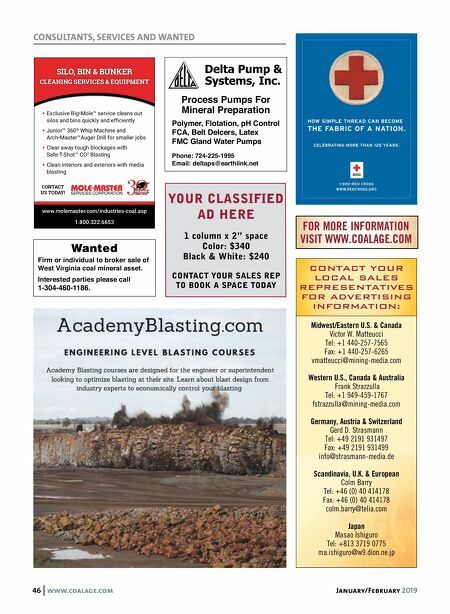 FOR MORE INFORMATION VISIT WWW.COALAGE.COM Process Pumps For Mineral Preparation Polymer, Flotation, pH Control FCA, Belt DeIcers, Latex FMC Gland Water Pumps Phone: 724-225-1995 Email: deltaps@earthlink.net CONTACT YOUR LOCAL SALES REPRESENTATIVES FOR ADVERTISING INFORMATION: Midwest/Eastern U.S. & Canada Victor W. Matteucci Tel: +1 440-257-7565 Fax: +1 440-257-6265 vmatteucci@mining-media.com Western U.S., Canada & Australia Frank Strazzulla Tel: +1 949-459-1767 fstrazzulla@mining-media.com Germany, Austria & Switzerland Gerd D. Strasmann Tel: +49 2191 931497 Fax: +49 2191 931499 info@strasmann-media.de Scandinavia, U.K. & European Colm Barry Tel: +46 (0) 40 414178 Fax: +46 (0) 40 414178 colm.barry@telia.com Japan Masao Ishiguro Tel: +813 3719 0775 ma.ishiguro@w9.dion.ne.jp YOUR CLASSIFIED AD HERE 1 column x 2" space Color: $340 Black & White: $240 CONTACT YOUR SALES REP TO BOOK A SPACE TODAY Wanted Firm or individual to broker sale of West Virginia coal mineral asset. Interested parties please call 1-304-460-1186.